Decadent hot chocolate, topped with yummy whip cream, drizzled with chocolate…. something you usually only see at your local cafe or coffee shop. But imagine creating this in your own home, or creating some other tasty combination. Chocolate orange, Lavender White, Peanut butter… oh so yum! 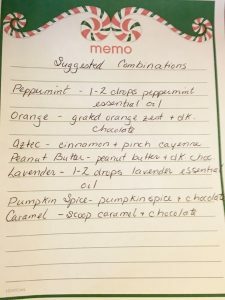 This is the beauty of a hot chocolate bar – a simple but yummy idea that enables you to create these wonderful, delicious combinations to enhance your hot chocolate experience. 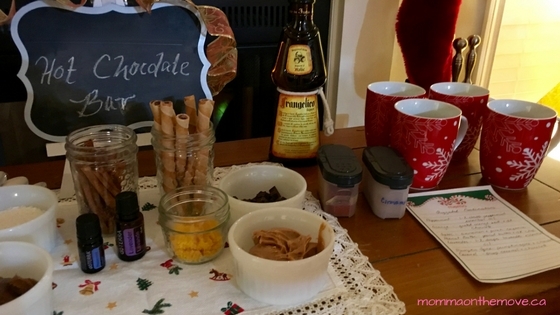 The basis of a hot chocolate bar is that you make a plain hot chocolate and then have a number of different toppings and combinations to choose from to add to your hot chocolate that make it… oh, just a little more. 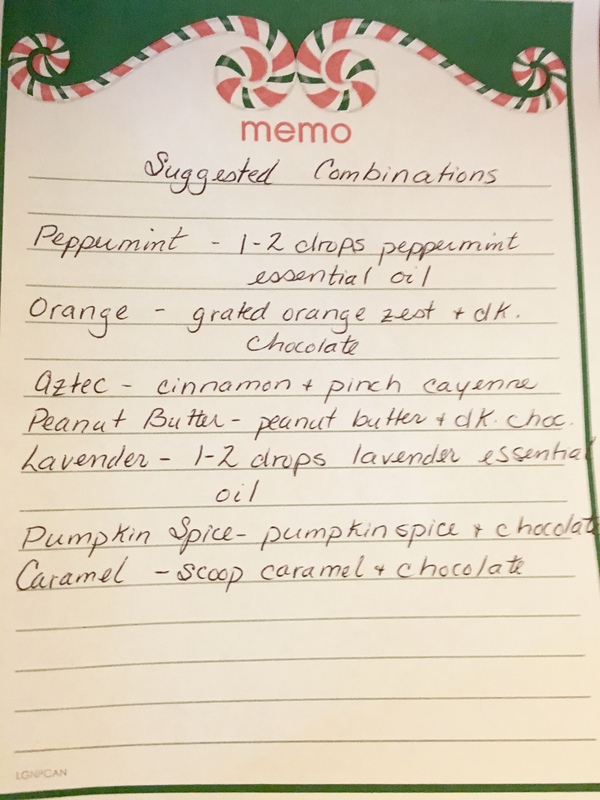 Good hot chocolate can certainly be enjoyed plain and definitely warms you all the way down to your toes, but these additions make it a little more lavish, make it a little more fun. It is also super easy to set up. It does not take a lot of time or effort, the most effort you’ll have to make is to decide what yummy toppings you are going to use! I did this twice over the holidays, once for a ladies only night at my place and second as a fun treat for my kids and nieces while away over Christmas. Everyone loved it! It was super fun. We all had half cups at a time experimenting with different tastes and flavors. I had created a list of suggested combinations but of course you could pick and choose whatever you liked. Plus just looking at the spread set out was not only nice to look at but made you want to try them all! 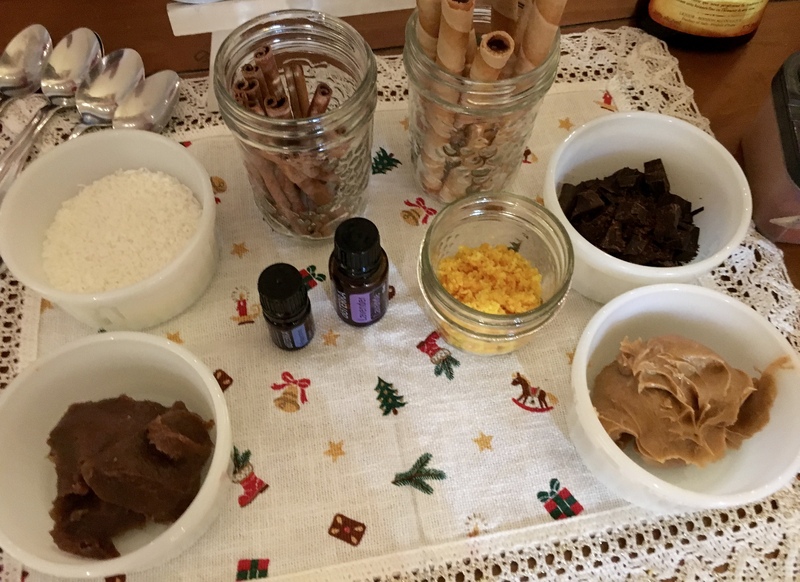 We had chocolate pieces, peanut butter, orange zest, hazelnut sticks, homemade marshmallows (mint and cinnamon), cinnamon sticks, coconut and some essentials oils like peppermint and lavender. We even had a little ‘adult’ version – a splash of Frangelico, if desired for those over 18. Start out with your own base hot chocolate – you can either do this by the cup therefore creating and meeting people’s dietary needs, like dairy free, sugar free or use the just add water powder mix. Or you can make a big batch of your favorite hot chocolate in the slow cooker. I have done it both ways and both have their advantages. Pick your toppings – there are so many to choose from! Add desired toppings and enjoy! Use suggested combinations or mix and match to make your own. A hot chocolate bar literally takes about 5 minutes to set up. When I hosted the ladies it was the easiest and shortest prep I ever had to do for a party. And I loved how visually appealing it looked before everyone dug in. This is also something you can set up in your home on the counter somewhere and leave for a bit for people to enjoy. Of course you’d have to put some of the items into the fridge when not in use but for the most part many of them can stay out. The thing I love about the hot chocolate bar is it can easily be sugar free dairy free and be very yummy and enjoyable. When my kids participated out of all the choices I set out there were only 1 or 2 that they had to avoid. The rest was far game. So it was easy for them to try different things, experiment and enjoy the full experience. I also love the versatility of it. You can create one for parties, after tobogganning, weddings, birthdays, after skating – and because of the variety of toppings there’s something for everyone! If you love hot chocolate then you’ll be super excited for the upcoming YYC Hot Chocolate Fest which I am proud to be a part of this year! Watch for more details to come! I love birthdays. They are fabulous days to celebrate people, how much we love and appreciate them and how happy we are to have them in our lives. Celebrating kids birthdays are some of the best, as they can be super fun and creative. There are so many themes, games, crafts and activities to do around a kids birthday and I personally love a good theme. I get really into it, creating details from the cake right down to the decorations. The one thing that is part and parcel of a birthday is of course, the cake. It is a tradition that has been around for centuries and one I honestly feel is just wrong if absent on a birthday (I hear in Sweden they start birthdays with cake for breakfast – they know what they’re doing). 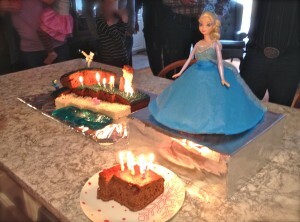 I have always loved the idea of a cut up cake, or a theme cake, something more than your traditional round or square. The designs, the colors, the creativity. My Mom made them for us growing up and well, even though my Mom warned me not to, I continued that tradition with my children. So for the twins, who just recently turned 6, we had a Minecraft and an Elsa cake this year; which I thought would be fairly simple. And well, once I figured out what I was doing, and all the pieces I needed, they were. Because we chose a number of years ago to go sugar free this has created some challenges in creating things like a sugar free birthday cake. The cake itself was easy enough to do but it was the decorating, the icing and other accessories that made it interesting. This year for Luke’s Minecraft cake we discovered a design that was pretty simple in itself but required Jello and Rice Krispie squares – which I had yet to figure out how to make sugar free jello or sugar free rice krispie squares. I had some ideas on how to do this but had not made them before. 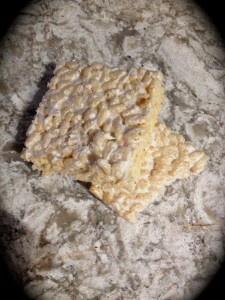 The Rice Krispie squares were easy enough. A couple of years ago I discovered a recipe on Wellness Mama to make marshmallows, so I simply made that recipe and then mixed in the gluten free rice krispies right away while the marshmallow cream was still soft (at one point I thought I would have to make the marshmallows let them set then melt them down…luckily my rational brain kicked in and realized that they would already be soft before they set and I could just mix it all together right away). Once it was mixed in I just pressed the rice krispies into a pan like I usually would. They turned out quite well, though not as sweet as an original Rice Krispie square, which I think was largely due to the gluten free cereal which is not as sweet to start with; otherwise they were great. The Jello was a little more of a challenge and this was simply because of the color I needed. 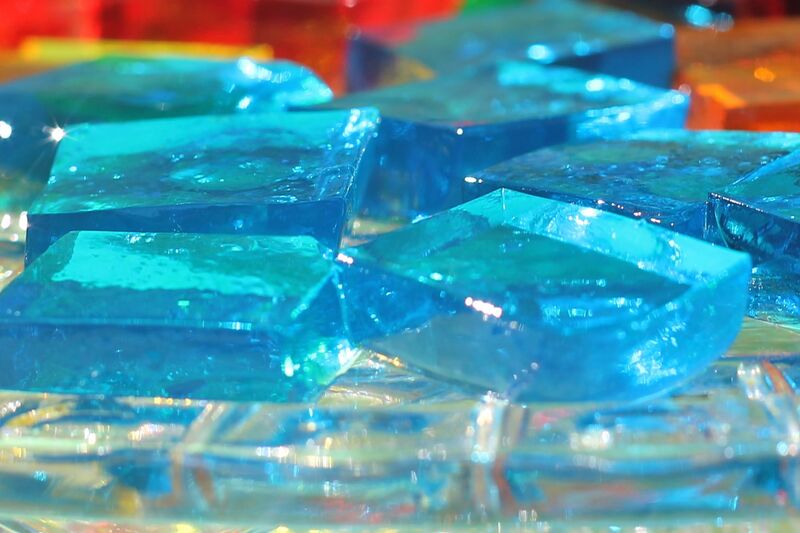 Jello in itself is easy you use plain gelatin add water and let it set. But when you’re using natural fruit juice as a base and trying to make blue… Did you know there is no natural fruit that creates the color blue? You might think what about blueberries? Nope purple. Red cabbage is as a natural food dye, also purple. I even Googled it to see if I could find anything. No luck. 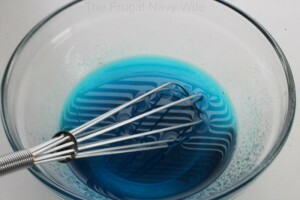 Eventually I found somewhere, the idea of using white grape juice and then adding a drop or two of blue food coloring. Though I would have prefered not to use the artificial food coloring I thought how much work did I want to do for this Jello. I decided a drop or two would be ok. 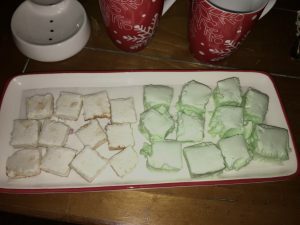 So I found a natural Jello recipe on Wellness Mama (the same site for the marshmallows) and had it made setting in the fridge in about 5 minutes. Easy. Pour the cool water in a large mixing cup or quart sized mason jar and add the gelatin powder. Stir until mixed- it will start to thicken a lot. Add the ¼ cup of really hot water and stir to mix- it should be thinner now. Combine this with the juice and mix well. Pour the jello mixture into an 8×8 dish. Put in the fridge, covered, for at least 2-3 hours or overnight and serve. 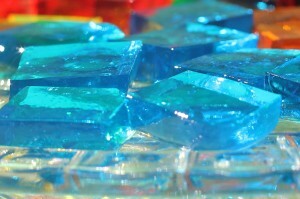 Cut into cubes or scoop out with a melon spoon to make cute shapes. Well it’s official! I can now make anything without sugar in it. When we went sugar free we really struggled at first, having to avoid things that we loved and enjoyed. But it was just going to take time to figure out how to make these things like cakes, cookies, chocolate, etc. without the sugar in it. What were the substitutes? How did you do it? It was a huge learning curve. I assured Matthew, my oldest son that I would figure it out. Cause one of the things I did not want to happen in going sugar free was for him to feel denied. That he could still have the yummy treats that his friends did, with the difference being healthier, better for you. Slowly I began to build my reperatoire, cookies, cakes, muffins those were easy. Bread, new sweet treat recipes, chocolate…we were getting there. Matthew was pretty happy too, except for one last thing, marshmallows. There was no substitute in the store to buy and I had no idea what to do to make them. He reminded me of this when we went camping this summer, mentioning that it would be nice to roast marshmallows… “I know” I said and assured him that I was on a mission; as marshmallows were the only thing that I could not make sugar free but I knew there had to be a way. 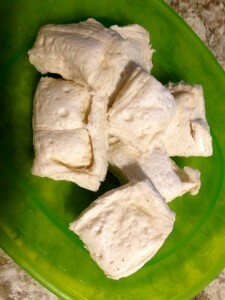 A little while back I found this recipe for homemade marshmallows on Facebook and just about died! This was the ‘missing link’ that I was looking for. The recipe I needed, and it was totally healthy! Sweetened with honey and very easy to make. So yesterday was the big day. I tried it out and Wow they were stupendeous! 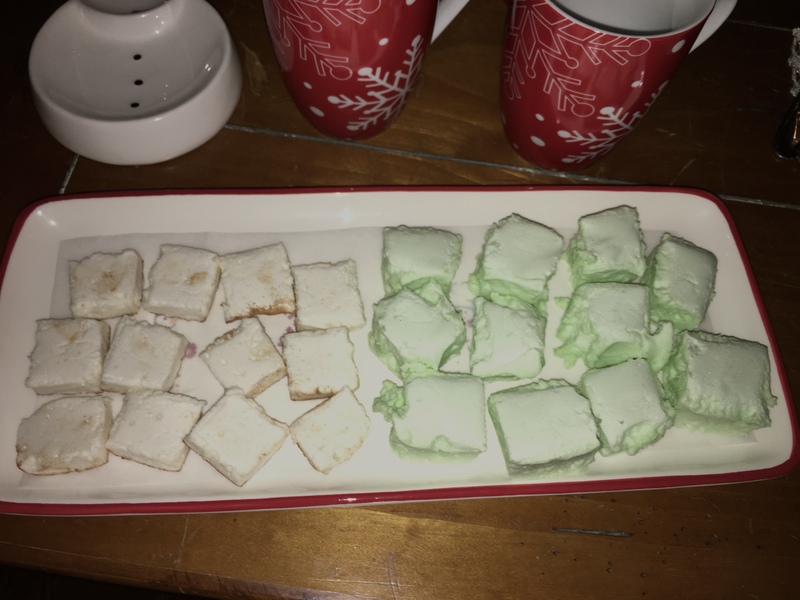 They look and taste like an original marshmallow and I don’t care how many my kids eat! 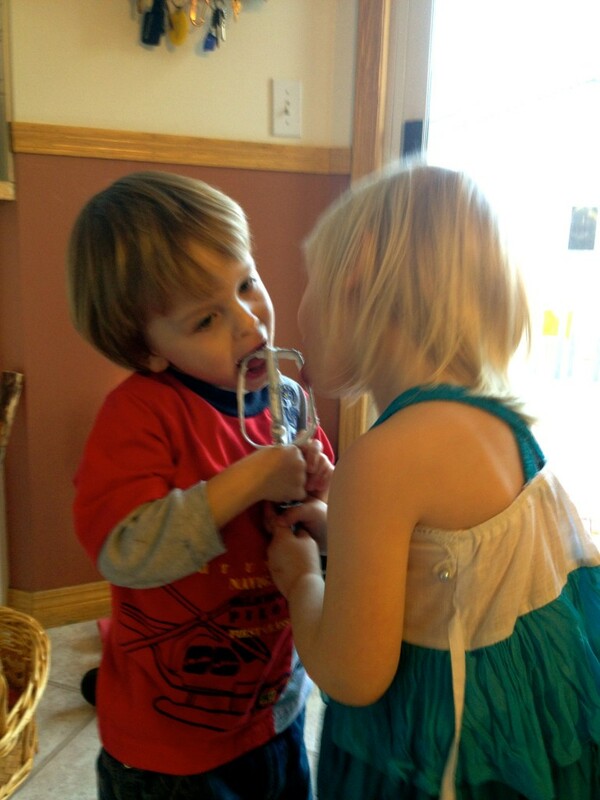 Unfortunately the marshmallows had to sit to set, but I let the kids lick the beaters. As you can see Luke and Chloe were thoroughly enjoying it! Attacking the beater with vigor. Matthew has attested that they taste just like regular marshmallows and just in time for our Halloween campfire tomorrow night. We are also set for camping next summer! S’mores, rice krispie squares and other marshmallow treats here we come! When letting it sit to set don’t worry about covering it. I made this mistake and ended up losing some because it stuck to the cover. Oops! lesson learned. When storing them make sure you line the bottom of your container with parchment paper, and layer it with paper in between. Again, they’ll stick and they’ll peel right off the parchment paper. Don’t forget to put one on the top before you put on the lid!